As is traditional, the December meeting of The Sheffield Circle of Magicians was a social evening for members and their partners. There were nibbles, a little magic, and a magic-related quiz (replacing the Christmas Puzzle Sheet of previous years following complaints from certain quarters that this required a level of thought and concentration unfamiliar to some of those attending…). 1. Who was the first Honorary President of the Sheffield Circle of Magicians? 2. What would you use a French Drop for? 3. What was Houdini’s real name? 4. How many cards are there in a standard tarot deck? 5. The motto of the Sheffield Circle of Magicians is “Ars est celare artem”. What does it mean? 6. Who is generally credited as the inventor of the Olram Subtlety? 8. Who was the Sheffield magician who gave Houdini the idea for the upside-down suspended straitjacket escape? 9. Who wrote The 13 Steps to Mentalism? 10. Balducci, and Asrah are both types of which commonly seen magic effect? 11. Under what name did the stage magician, debunker, and scientific skeptic Randall James Hamilton Zwinge perform? 12. In magic a ‘restoration’ is an effect in which something is seemingly destroyed or multilated, and then ‘magically’ reconstituted. What well-known restoration trick was patented by Horace Goldin in 1923? 13. Who invented The Curzon Envelope? 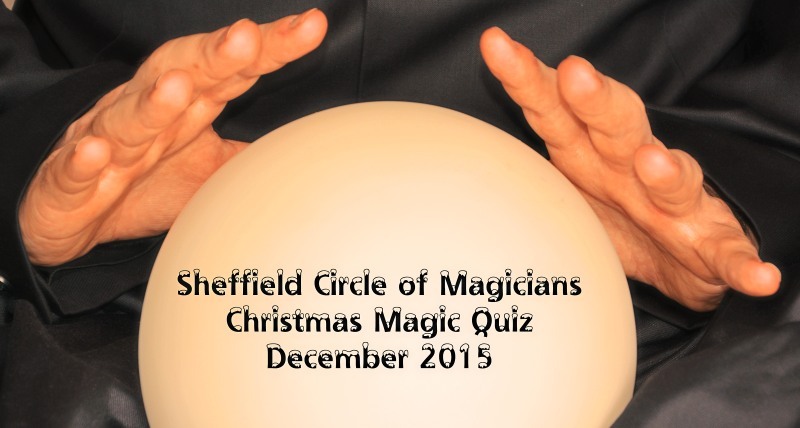 Tie-Breaker: In what year was the inaugural meeting of the Sheffield Circle of Magicians held? The winner of the cheap bottle of wine was Ashton Carter with 11 correct answers. Can you beat that? (Without the aid of Google!) Answers will follow with an appropriate minimum of alacrity.